Walkthrough map with a huge room of enemies at the end. Fire door at the end doesn't open. May be because button was pushed before all enemies were destroyed. May be its just broken map. 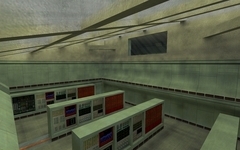 Yes it does My mistake, you're correct, it doesn't - there are three buttons to be pressed, one by each of the two fire doors and the third which is hidden in the shadows on the wall behind the red crates in the "stupid quantity of Agrunts" spawning room, at the end of the map. Pressing all three gives the traditional "to be continued" message, but - more importantly - totally fails to end the map which then just sits there waiting for the server to cycle, or for someone to rtv. Schoolboy error, not having a game_end. Emteg made some good maps over the years, Between is a lot of fun, so is Murks, this one however he made before considering the concept of "balance" and so it's just ridiculous horde-spawn-in-face of mostly Agrunts. Fine if you're on an all-cheats stupidity server, but not so much fun otherwise. The end room is just 30 or so Agrunts (and a few other monsters) hammering you constantly with hornets and snark nests. There is a portal based shortcut system, but that doesn't make up for the ridiculous monster spawns.